← Alaska Reflection 4 – Mother I feel you under my feet. If I had to choose one word besides “awesome” to describe Alaska, it would be the word “vast.” Alaska is over one-third the size of the lower 48, and a great deal of it is unreachable by either the road system or the Alaska Marine Ferry. Journeys to many villages, wilderness cabins, national park trails and off-the-grid adventures require a drop-off by a bush pilot. If you want to get away from it all, try traveling through the vastness of Alaska in your own vehicle. The few roads that exist have long stretches between cities and towns. Although there may be hundreds of cars on the same highway, you still might not be passed by another car for hours. And then there are the less traveled, rugged roads like the Dalton Highway, Top of the World Highway, the Denali Highway and the McCarthy Road. For me, solo venturing on these roads was truly following a spiritual “road less traveled,” and I rejoiced being absorbed into the scenery dotted by wildlife, tundra, glaciated mountain slopes and braided rivers. 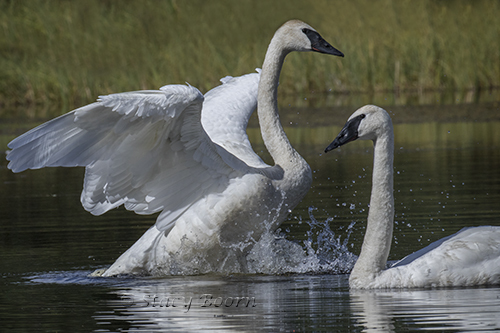 My spirit soared with the eagles and sang with the trumpeter swans. 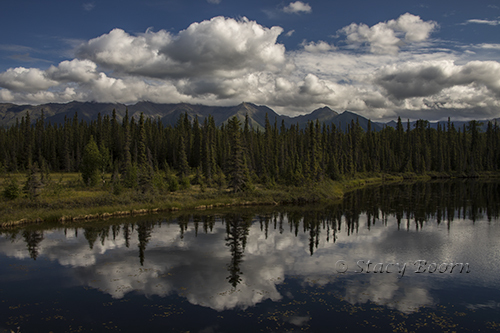 I entered the Wrangell-St. Elias National Park via the unpaved, rough and rocky 60 mile McCarthy Road from Chitina to the Kennicott river foot bridge, the foot bridge that leads to the towns of McCarthy and Kennecott. Stopping for pot holes and the beauty along the way made for an all-day trip. At one point, the surface of the road disappeared into mud produced by a flash flood the previous day. 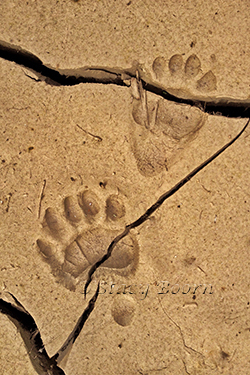 While photographing the patterns made by the cracked and drying mud I noticed fresh bear prints. Perhaps the bear, most likely a black bear, was watching me from the woods. The road follows the route of the now non-existent CRNW Railroad. Five miles from where the road ends is the Kennecott Mines National Historic Landmark where history still comes alive. A nation hungry for copper went to incredible lengths to extract it from this formidable terrain and climate (think winter). Copper was needed especially for conducting electricity. The Kennicott Valley lies along an extensive ore stream where generations of Ahtna people collected native copper, working it into art, utensils, and arrowheads. I learned that, though the mine’s name is spelled with an “e,” the names of the town, glacier and river are spelled with an “i” after naturalist Robert Kennicott. Developing the rich body of ore required tremendous effort, ingenuity and money. In the early 1900’s one could not find any more wealthy backers than the Havemeyer, Guggenheim, and J. P. Morgan families, and, as today, the rich became richer. In its short life, Kennecott Mine produced 200-300 million dollars worth of copper and silver. 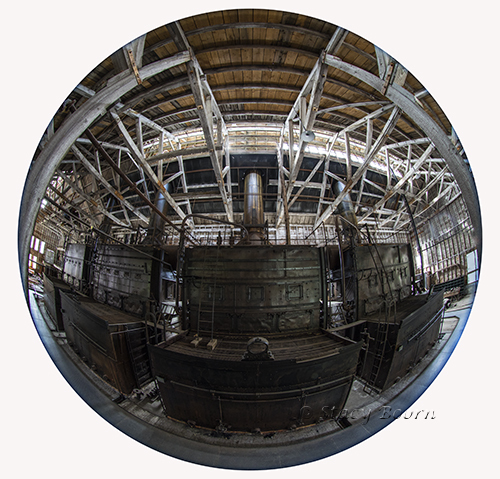 By the time of its closure in 1938, when the copper ore went dry, there were 100 buildings in the now abandoned camp. Today over thirty structures remain in various conditions. 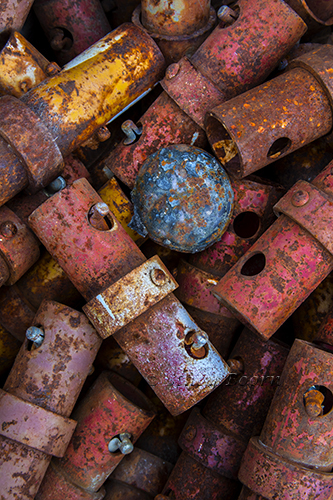 The rules say that you can take home as much rock and ore as you wish, but you may not take a rusty nut or bolt or sliver of wood because they are “historical artifacts.” This includes the piles of what we would consider garbage. At 10 PM, I walked to a viewpoint overlooking the Kennicott Glacier and sang the grandmother invocation. I stopped when I got to the stanza, “Grandmother, I see you sitting in earth,” and I made a small circle of rocks, stood in it, and finished singing. — And still I sing, “Grandmother, I feel you sitting in my heart, you are sacred, and you are looking at me …” The stones, the ‘ebens’ that came out of the belly of the earth surrounding copper ore and memories of times before humans dug them up, are still a memorial to your everlasting love. Tundra ponds on the McCarthy Rd. 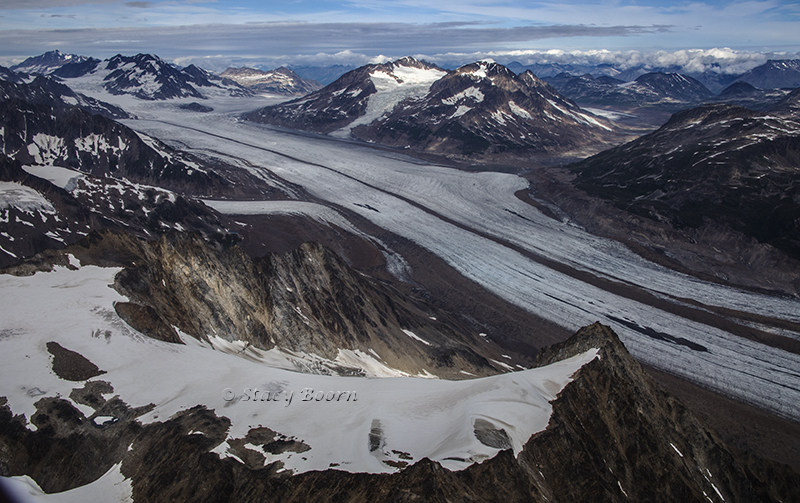 This entry was posted in Uncategorized, Weekly 2 and tagged Alaska, Black Bear Prints r, Kennecott Mine, Kennicott Glacier, McCarthy Road, Stacy Boorn, Trumperter Swans, Wrangell-St. Elias National Park. Bookmark the permalink.